For the longest time, I always believed that I was born in the wrong time period. When I was younger, I thought I most definitely belonged in the 50's and 60's when foxtrot, swing, hand jive and cha cha were all the rage. Now, in the 21st century, I can't help but think how much I would have thrived as a student today surrounded by educational technology and innovative ideas. 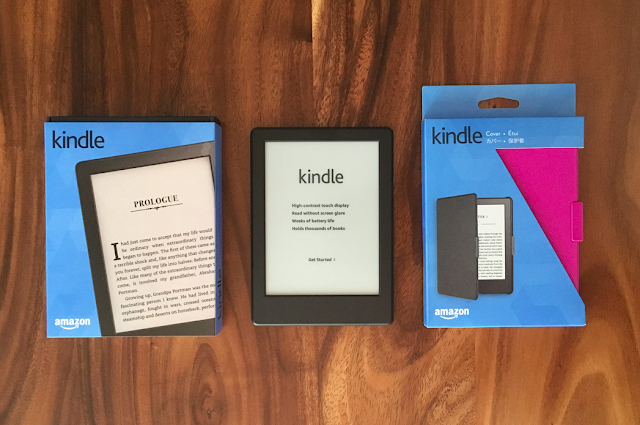 Take, for example, the all-new Kindle E-reader. With its thin and ultra light design, kids can keep up with their latest novel study by reading an e-book version without screen glare, making it easy on the eyes. And because it holds thousands of books and boasts a battery that lasts for weeks, they can enjoy their own personal mobile library anywhere they go without distractions such as alerts or notifications. But what makes this device all the more innovative is the built-in Kindle FreeTime feature. The Kindle FreeTime feature allows parents to set up profiles for their children and set reading goals. For example, you could set their daily reading goal to 30 minutes and, if they achieve that goal, they will be rewarded with achievement badges. Because you can customize these goals, you can slowly increase them as your child grows in their reading ability. Badges and personalized goals would have been a big motivator for me as a reluctant reader, I am sure. Parents are kept in the loop with a progress report that shows total time spent reading, number of words looked up, badges earned, and books read. Plus, they can rest assured that their kids are enjoying books in a simple, fun, and safe environment, knowing that they cannot access the browser or make purchases in the Kindle Store thanks to best-in-class parental controls. 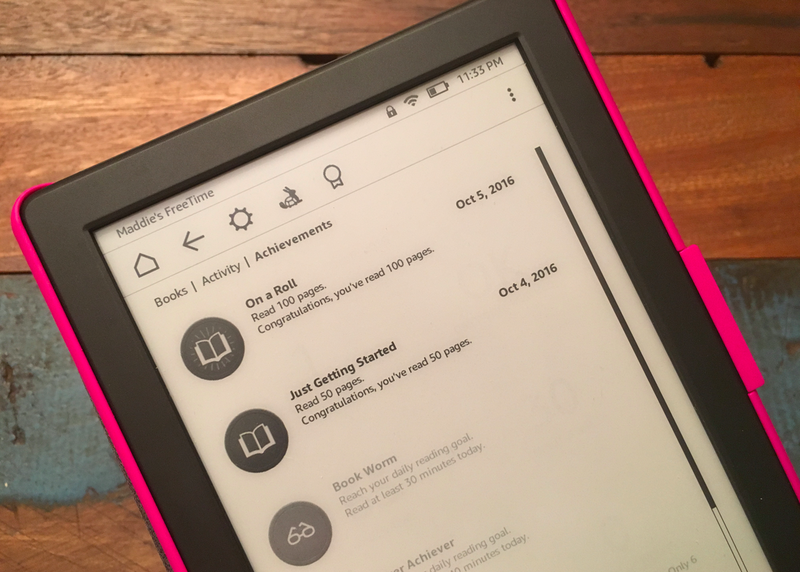 While families can celebrate reading milestones with Kindle FreeTime achievement badges, kids reading their first chapter books can tackle more challenging books with a little help from Word Wise. Available on many popular English language titles, Word Wise provides short and simple definitions that automatically appear above difficult words, making it easier to enjoy and quickly understand what they are reading. They can also tap on a word to bring up a simple card with definitions, synonyms, and more, improving their vocabulary. Win a $100 Amazon.ca Gift Card! To help you and your little ones celebrate reading milestones with Kindle FreeTime, one lucky reader will win a $100 Amazon.ca gift card! 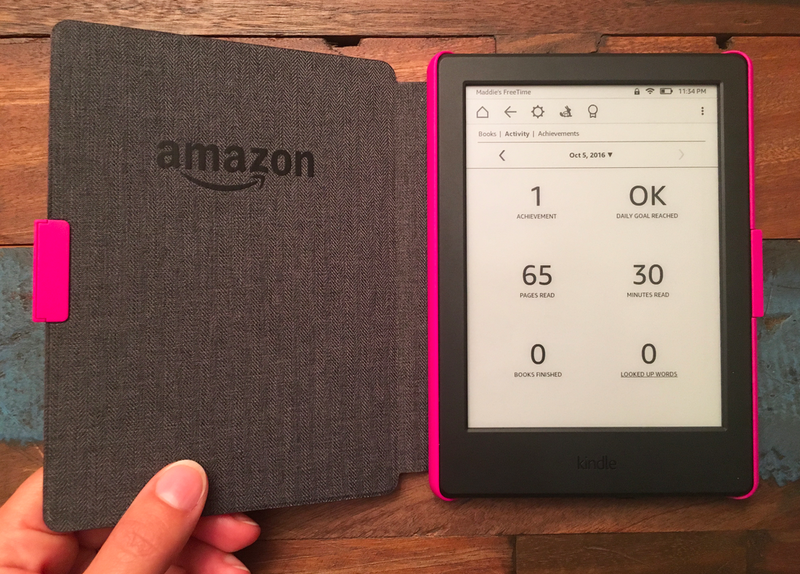 This could be used to purchase the all-new Kindle E-reader, which currently retails for $79.99, a protective cover or even to update your e-library. Simply leave a comment on this post sharing what you love most about the all-new Kindle E-reader or the Kindle FreeTime feature and complete the Rafflecopter form below. Open to residents of Canada, excluding Quebec. Disclosure: I received product samples and other perks to help facilitate this review. Any opinions expressed in this post are my own. I like the fact that the battery lasts longer - much longer. I love being able to set reading goals with the Kindle FreeTime. That's brilliant. I like being able to set reading goals for the kids with the Kindle Free Time. What an awesome idea. I love that the Kindle free time tool gives kids a sense of achievement and allows kids to read on a device without distractions! I like that I can set reading goals for my kids. Something that would be useful for them and me. LOVE how it allows parents to set up profiles for their children!! Thanks! I like that I can set reading goals and that they send progress reports to parents. I like its thin and ultra light design, and the extra long use battery! I like that you can set up reading profiles and set reading goals for you and your kids! I like that you can set daily reading goals! Love the parental features and the fact that I can my child's reading progress! I LOVE that the Kindle Free Time feature encourages reading and interaction with kids, and provides parents with progress reports- how awesome! I love how the Kindle sets daily reading goals for kids & the WordWise feature is so important in teaching children the definitions of words they may not understand! I love the long battery life. Great for long trips. The Free Time is great to encourage kids to read and learn new words. I truly do like the longer battery nothing like a battery dying & the read goals that can be set. I like that the kids can set reading goals and that the battery lasts for weeks. i love that you can set kids profiles that parents an monitor and use as tools to motivate and set goals. I also love the dictionary feature - what a great feature! Never having to skip a word or guess its meaning in context is absolutely wonderful! I like that you set up profiles. I like the idea of the achievement badges which children love. I like the longer battery life! It would be terrific to win a $100 Amazon.ca Gift Card. or the Kindle FreeTime feature? to set up profiles for their children and set reading goals. I like that you can set up profiles and goals, but I especially like the longer battery life. I love that you can set up reading profiles and goals. A long life battery is what I appreciate the most. The long life battery. I hate when I get to a good part and I have to recharge. I like that you can set reading goals. I like the WordWise feature. That's a great way to increase understanding of what you are reading. I like how you can set up reading profiles so we can share! I love how the battery lasts way longer! Long battery life is important and the reading goals is awesome feature. Setting the reading goals for my kiddos and myself and the long lasting battery! Two awesome awesome features!! I love the daily reading goal feature! It's a great way to make sure the kids read something everyday. I like being able to set reading goals for the kids with the Kindle Free Time. I think it's a great way of encouraging them by setting goals. I like the word wise feature. I really like that the battery lasts 4 weeks on this new Kindle and the Word Wise feature sounds like a life saver! I like the word wise program. It sounds really interesting and useful. Definitely like the reading goals, at first I thought great fir the kid but then I thought what a great challenge for me. I always say I'm going to read more. I definitely appreciate the longer battery life. I love that you can set reading goals! This would be absolutely perfect for my son! I love that my book loving kids can set goals. A long battery life helps too. I think it is so important for kids to read so the feature where you can program it for your children to set goals is the best! I like that you can set up set reading goals with the Free Time feature. What a great motivator for kids! I love the reading goals. Such a motivator! I love that I can set daily reading goals! I love that kids get rewarded with badges! This could be used as an incentive for getting technology time....get 3 badges , you get an hour...or something like that...definitely a great idea! I especially like the long battery life, won't have to keep charging every other day! I love the ultra-thin design most. I LOVE THAT IT IS THIN AND LIGHT. love how you can set goals and the battery life. I like the goal setting feature. The reading goals is a great feature! I like that it doesn't have any screen glare. I love setting reading goals to track progress and of course not wasting paper! I like how you can set reading goals! I like how it encourages kids to read. I love the achievement badges - encourages further reading! I like that it has a no-glare touchscreen. Easy on the eyes. My favourite is the anti-glare!! I love that it sends progress reports to parents so kids don't feel like you are checking up on them all the time. What I really like the kindle is the Single battery charge lasts weeks, not hours! Nothing worse than just getting into a book when your out and the battery is to low! I like that Word Wise provides short and simple definitions that automatically appear above difficult words. My e-mail is elixer2@hotmail.com. I like that it has a long battery life and goal setting for kids. I love that the Kindle E-reade is thin and has an ultra light design and kids can keep up with their latest novel study by reading an e-book version without screen glare, making it easy on the eyes. I like that the battery lasts a lot longer! I really like that there is such a long battery life. The longer battery life is amazing! I like how it allows parents to set up profiles for their children. The Kindle FreeTime feature allows parents to set up profiles for their children and set reading goals. I love that it teaches the definition which can greatly improve reading comprehension. I love that the all-new Kindle E-reader is 11% thinner and 16% lighter than the previous generation Kindle. Love the reading goals that is a great feature to set. I like that it has a battery that lasts for weeks and is light weight. Word Wise is a great idea and makes reading books a little harder than your used to a lot easier! I remember when we had to look up hard words in the dictionary and the constant stopping ruined the flow of reading the book. The long life battery is something I am looking forward to especially when going camping on long weekends. word wise sounds great for both mom and kids. I like the long battery life and the memory storage for all those books! I love that the battery lasts a super long time and the free time is something I think my kids would love. The achievement badges seem like a great motivator! I like that it has such a long battery life. I like that it is lightweight because there are already so many other things you have to carry around day to day. The lighter the better! I also like that the battery is suppose to last for weeks. Most devices die so quickly and you end up having to charge them every single day; sometimes more than once a day. Love the long lasting battery! And love having all the books I need in one place! One can never underestimate the power of good battery life...you can be stuck in airport purgatory for a few extra hours pretty easily! I really love the reading goal for children because there's nothing more empowering than reading. It provides practical skills as well as a relaxation outlet in life. Kids probably love the feeling of achievement the badges give and the reinforcement by their parents. I would absolutely use it. I love the long battery life because sometimes the book is to good to stop reading! I really like that you can set reading goals! I was always goal and number oriented as a kid so I think the FreeTime feature is excellent and the fact that it sends reports to parents is an extra bonus. I love the idea that I can set goals! I can be pretty goal oriented so I think that would be a great motivating application. Just like hitting your 10000 steps, it's time to hit your 10000 pages! I love that you can have reading goals. I love that parents are kept in the loop with progress reports and that parents can set goals! This would be amazing for my daughter! I like the battery life on it the most! I like that you can make reading goals! I love that you can have personal profiles and set reading goals for the kids too! Long battery life. That is the most important thing, to me. I love the FreeTime Feature because of the achievements. That would be great to get kids to read more. Definitely the long battery time!! I'm always losing battery time! I love how it has a long battery life. I do not have any reading devices, so for me being lightweight and easy to use is enough to be the best features. I like that the battery lasts longer. I like the WordWise feature - great way to teach new words. I love the Word Wise feature, and think it would be great at encouraging independent reading! I love the badge system, it will certainly encourage kids to continue reading . I like that it has personalized goals. That would be motivating for my kids. I like the price and that it's lightweight. I LIKE HOW LONG THE BATTERY LASTS! That battery life is much better! Love the long battery life. NO distraction reading for me and the kids. This is so great! I love, LOVE this ereader's features! Very well made, a lot of features, I like the different version so it, some durable like waterproof.